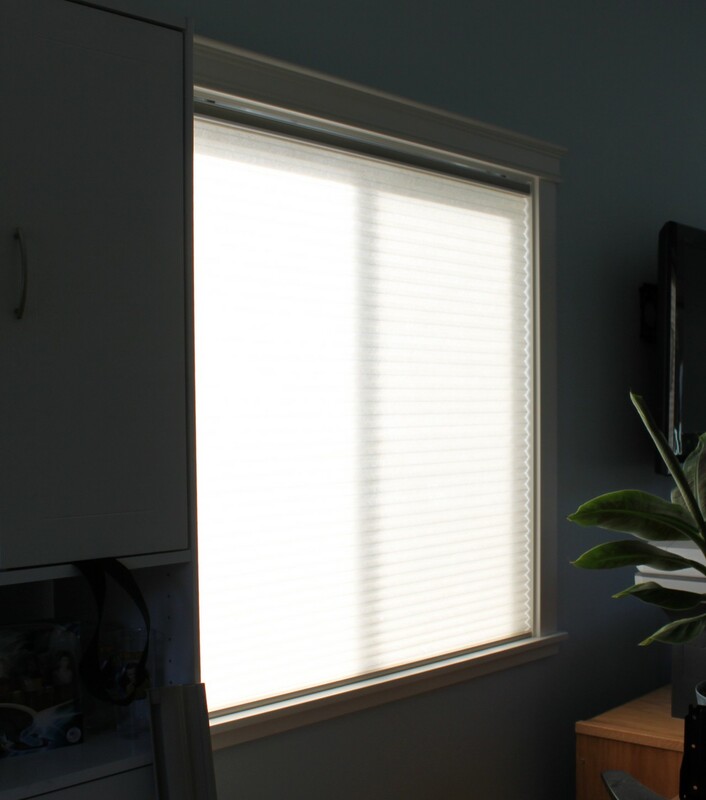 I decided to upgrade the office with an automated cellular shade for two reasons: 1) I like the privacy of having shades that automatically close at sundown, and 2) it’s more convenient to operate the shade from the desk rather than having to get up and climb around the table. In the picture above you can see the shade itself (bottom), a bag containing clips for mounting the battery tube, a bag containing a programming cable, the telis 4 remote, the battery tube, and a package of AA batteries. So what we can see is the ct32 radio motor. 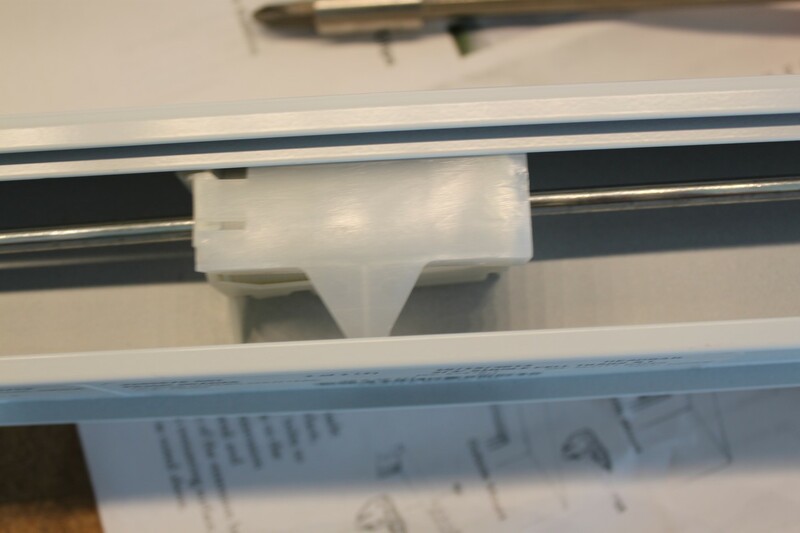 It has a black bracket that holds it in, a black shaft adapter in the end of it, and is connected to a metal rod that operates the shade. The metal rod operates two plastic reels, each of which has a cord wound around it. When the motor turns, it winds the cords up in the reels, lifting the shade. When the motor turns the other way, the cords unwind, dropping the shade. What you’re looking at above is a view looking straight up form the bottom of the window. 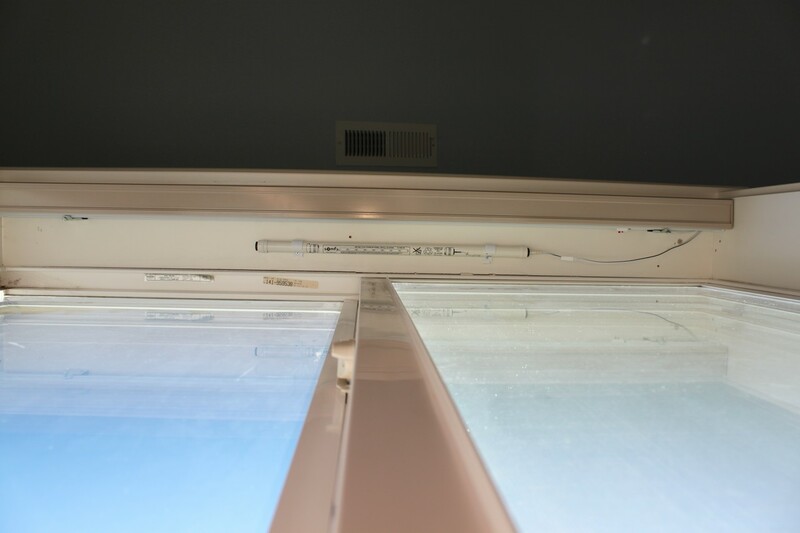 You can see the shade mounted at the top. There’s two metal clips that hold it, each clip taking either one or two screws, depending on your preference. The shade snaps into the clips. 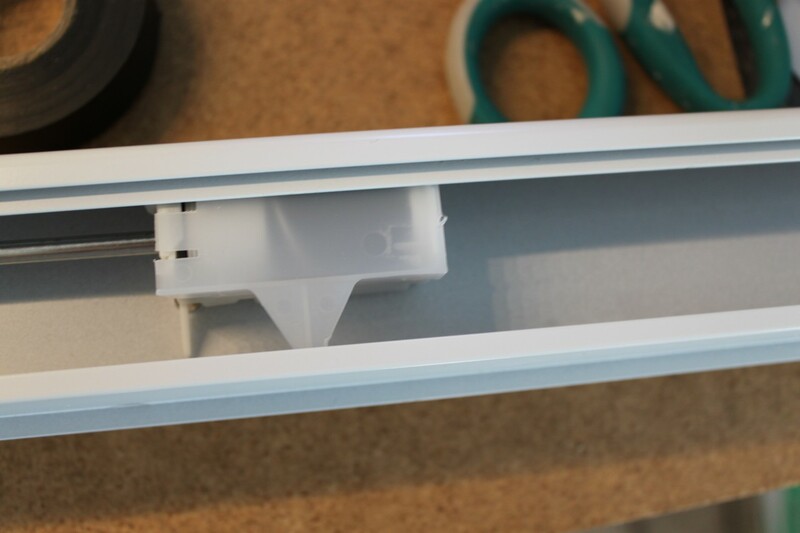 Between the shade and the window is the battery tube, which is filled with AA batteries. 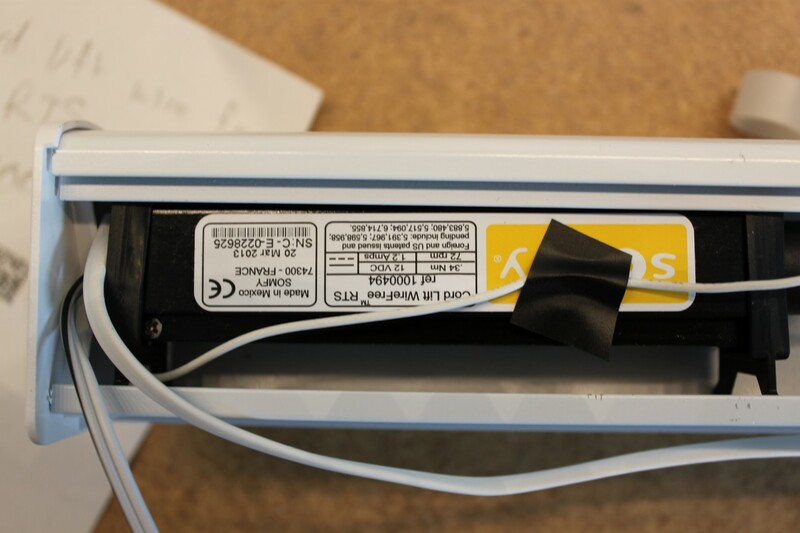 A small wire connects the battery tube to the shade. The tube and wire are very well hidden, tucked up inside there. Pressing the UP button momentarily will make the shade go up. Pressing the Down button momentarily will make it go down. Pressing the My button while the shade is moving will cause it to stop. Okay, simple enough. Now let’s automate it. Well that makes it obvious what’s going on. 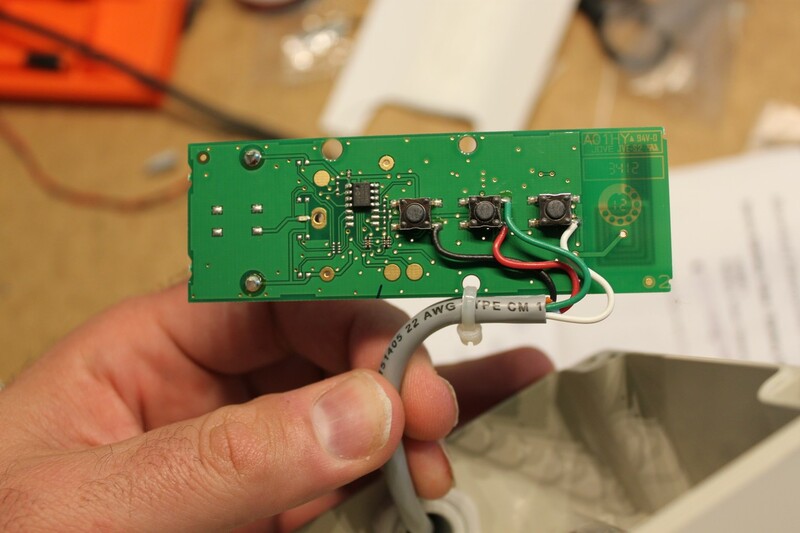 It’s a remote control with some wires soldered to the buttons. The green wire is common. The white and black write are op and down. The red wire is the “My” button. Why it’s in such a huge plastic box I’m not sure. The standard way smarthome recommends automating this with insteon is with an IOLinc. You connect the green to common, the white to NC, and the black to NO (or vice-versa as is your preference). Turning the IOLinc on closes the shade. Turning the IOlinc off opens the shade. This is kind of a crude solution as the IOLinc is a 2-state device. It’s not really adept at sending two different momentary signals. It either pushes the up button or it pushes the down button. All the time. There’s no way to get positional feedback, so your automation system doesn’t know the state of the shade. Technically, this is fine if you only control the shade with the IOLinc. 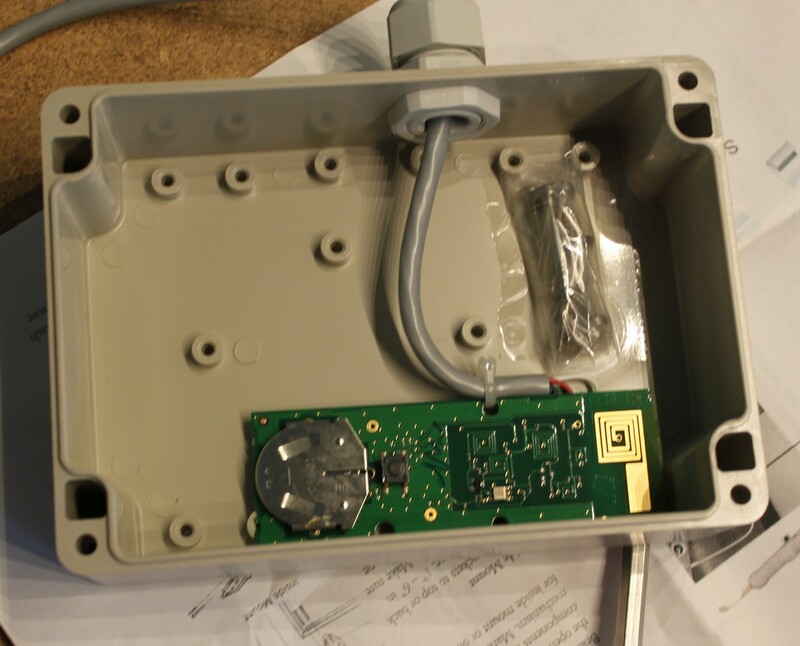 However, if you have people also controlling the shade with the RF remote, then you could get in an inconsistent state. This way, regardless of whether the automation controller thinks shade is currently up or down (i.e. if someone has played with the RF remote), it is always sends an “up” command 10 minutes before sunset. There’s a short jog for 1 second while where the shade may move momentarily down, but this is a small price to pay. If the IOLinc had been a 3-state device, or if two IOLincs were used, then it would have been a little bit more convenient. Nevertheless, Success!